Its World IBD Day today so since it’s Saturday and every living creature with an appetite is out hunting down new prey, I’m going to celebrate the day for the whole week. I’m biased, of course. I’ve been living with Crohn’s disease for over 31 years. It’s one of the family of nasty Inflammatory Bowel Diseases, (yes, Bowel diseases) that includes Ulcerative Colitis, but does not include IBS, or Irritable Bowel Syndrome (more on that in another post). Since its such a gross topic (bowel disease, you can only imagine) I’ll skip the details of my experience and go straight to highlighting those individuals who have shared with us some remarkable stories. You’ll see the index below to get you started and every day this week you’ll see some of these stories and individuals highlighted on our home page. Trust me. It takes a little bit of courage to talk about your toilet habits in public. It can be funny, but these folks aren’t getting paid to entertain a crowd at a comedy club. What they are doing is breaking down the stigma attached to these illnesses, and in so doing, are changing the world one story at a time. Bravo to these articulate souls. We’ve got award winning author Jon Reiner, mountain climber Rob Hill, prominent advocate Michele Hepburn, Ben from across the pond in the UK, and many others in writing and video. Feel free to add your story to theirs. When Zal Press was 29 years old, he went to the hospital with a pain in his gut that felt like he had “a cat trapped in [his] stomach trying to claw its way out. 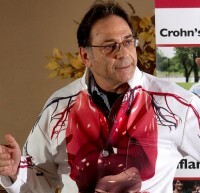 Thirty years later, Press has moved on with his life, but he certainly hasn’t forgotten about Crohn’s. About two years ago, he set off on a journey to try and get involved in changing the Canadian health-care system and the way patients perceive chronic illness. “I became attracted to patient advocacy and patient empowerment and this whole new movement of this educated, informed, Internet-aware patient who’s engaged in their own health care,” he says. Last year, after giving up a successful art business, Press started Patient Commando, a theatre production company that uses storytelling and humour to empower patients. The company’s debut production is a performance of Cancer Can’t Dance Like This, Daniel Stolfi’s comedic dramatization of his two-year battle with cancer. The production has been staged in Toronto and Montreal since its premier at Second City last May. To date, Cancer Can’t Dance Like This has raised more than $60,000 for cancer research. Patient Commando is the only entertainment company in Canada producing theatre, workshops, video and speaking presentations with a focus on the patient experience. Dr. Sandy Buchman, a palliative care physician and president-elect of the College of Family Physicians of Canada, agrees, and suggests that healthcare providers will also stand to benefit from this kind of endeavor. Cancer Can’t Dance Like This runs May 12 at Toronto’s Glenn Gould Studio. For more information, visit patientcommando.com. On Thursday, May 12th, CBC’s Glenn Gould Studio will play host to Patient Commando’s presentation of Cancer Can’t Dance Like This. With comedy at its core, this one-man show vividly portrays Daniel’s experience with cancer. Told mercilessly with a thrill and lust for the finer things in life, Cancer Can’t Dance Like This recalls the pain Dan endured during his treatment while embracing his own saving grace – the fine art of comedy. This production will benefit Lilah’s Fund, which raises funds for cancer research that mostly affects children under 5 years old. The fund is led by the bubbly, 6 year-old Lilah Petersiel, whose own battle with cancer inspires all affected children with the hope of a healthy outcome. Welcome to Patient Commando’s blog. We’re pleased to tell you that we are currently updating our site. So where does the discussion begin? How do we put a price on human life? The Star references the case of a patient with a rare disease whose life saving treatment is a drug costing $500,000 a year for life. It’s an impossible position for a politician to be in. Or is it? Over 50% of the population suffers from a chronic illness like arthritis, diabetes, lung disease, cancer, inflammatory bowel disease etc. And the cost of life saving and life altering drugs continues to escalate as the pharmaceutical technologies become more complex and sophisticated. Sounds like a merry-go-round – wondering when it’s going to stop? Agreed, the discussion has got to start. We need to develop principled understandings so as to manage the reality of the cost of chronic illness in our society. Unfortunately, it looks like a real hot potato issue that no one really wants to touch yet. Except for opposition party politicians who will use heart-wrenching individual cases to make the government look bad. But I doubt they’ll have the courage to engage in a real dialogue. Meanwhile, The Star editorial drew zero comments. What does that say?